How do I target special audiences and what does it cost? If you require a target audience that is not available through the playtest order form, we can try and find these players for you :). It costs more than a standard targeted player (i.e. a player available through the order form) and may mean a longer turnaround time on the playtest, so please keep that in mind! Below is an explanation of how to do it, what we do and how much it costs. The first is by reaching out directly to your Account Manager or hello@playtestcloud.com with the player profile information. 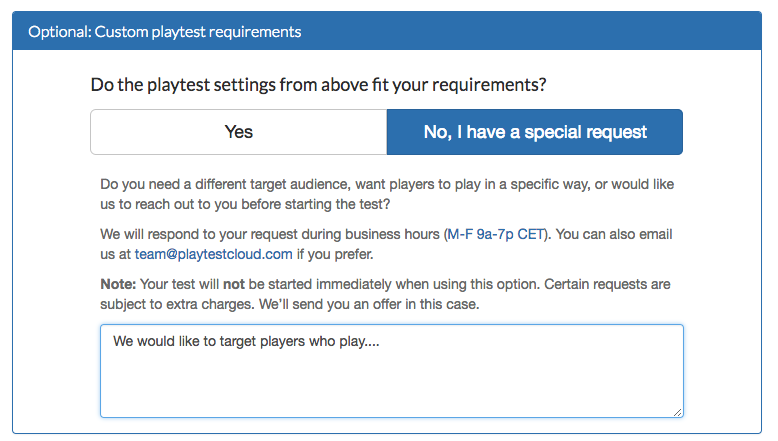 The second way is by detailing your requirements in the 'No, I have a special request' section at the bottom of the order form when you build your playtest order; then we will reach out to you with a quotation and next steps. Special player requirements i.e. Do they like or play certain games that are not available through the order form? Are there more than one player groups, if so what are they? Do they have a certain level of progress in a specific game? Is it important that they have not played a certain game? etc. After we receive the information we will run a feasibility check and get back to you! What is a feasibility check and how long does it take? Dependent on the type of request we can either search the database and give you an answer as to whether or not we have the players within the same day or, and more often, we have to run a screener with our player database to see if we have the players available to guarantee you the results that you need. If you are looking for players who have certain games already listed in their player profile under 'games they like' or 'favorite games of all time', then we can do a quicker scan of our player database for you and let you know roughly if we have enough players. If it is more extensive, then it will require us to screen* the database. You will have the feasibility results around 24 hours after we launch the screener, so please factor this extra time into your playtesting deadline. If the results come back looking good, then we are ready to launch the test! If we do not have the players for you we will make suggestions as to how the playtest can be altered in order to run successfully e.g. widen the age range, include midcore players or reduce the number of total players in the playtest etc. and run the check again. In general, the more relaxed the requirements the easier it is to find the players. *'Screen' as in 'run a screener (survey)' with our player database. This is where we send out a specially designed set of questions. tailored to your request, to the players to see if we can find the players that you need. We will always reach out and confirm the exact quotation with you before launching any playtests. The way that we price special player targeting is by applying a multiplier rate to the base price of a playtest. Below is an example of what special player targeting looks like for a 15-minute playtest (our lowest priced playtest), but you can use these multiplier rates on longer playtime session lengths. Base: As an example, a 15-minute player recording with a 'standard' player (or a player you can select yourself using the order form) would be US$49. Fans of specific games or other interests*: A 15-minute recording with a player with special interests (a player who likes specific games for example) would be the US$49 x 1.5, so $73.50. Players with specific devices: A 15-minute recording with a player with let's say an iPhone X or for Android a Samsung Galaxy S8 would have the same x1.5 factor so: US$49 x 1.5, so $73.50. Progress within a game: A 15-minute recording with a player with progress in a certain game (e.g. has at least 10+ hours experience with X game) would be $49 x 1.5 so $73.50 per player. *'other interests' can include things like television shows, brands, sports etc.